This is a study that describes the development process of a project that regards the visualization of personal sleep data collected with an app called Sleep Cycle. The project was first intended to be referred to as “Sleep Harmonics” because of my preliminary assumption that there is a poetic and harmonic quality in my personal data. My immediate intention was to visualize this data in a informative and visual manner. I assumed that the processes of sleep, could produce harmonious sounds based my sleep quality. I was inspired by nature’s cyclical phenomena such as planetary motion, water waves, plant growth, and various intriguing mathematical patterns. I wondered if these patterns and cycles were to be scaled to right speed and extent, could these be guided by music theory, overtone scales and the Fibonacci sequence? Would these cyclical phenomena then produce harmonies when combined? If my sleep cycle is repetitive to very similar extents, would it then be able to harmonize together with these natural cycles? I wanted to find a way of visualizing and representing this occurrence through my personal data. Having this misleading assumption in mind, it took me a couple weeks to accept the fact that my data alone, could not embody order and harmony. Although my data set only consisted of just 25-30 monitored nights, I started to suspect a feeling of misrelation and disconnection with my personal data. Is started to ask myself, am I the data? and is the data me? I realized that immense manipulation of this data is necessary before a communicative meaning can be extracted out of it. This process intends to translate data into a human visual language — a highly abstracted semantic system. But by its function, this language cannot translate subjective experiences, even though it translates quantitative information very well. In other words, immense amounts of sugar coating is necessary before something that is visually pleasant—is produced out of something disorderly and chaotic like data. Regardless, I managed to visualize my data, and I felt like my data was represented well, some quantitative details where drawn, but the qualitative and aesthetic fell was not recognized from my personal point of view. It was an informational representation of data that will not give a subjective connotation when I would decide to look at it back in time. When data gets extensively manipulated, only then would something be produced that can be comprehendible to humans. But when data gets translated into a visual language, its qualitative and personal aspect, is striped away. Humans have developed this weird abstracted semantic language for representing data; constituted by bar graphs, charts, lines, and points. These require vast amounts of familiarity with a symbolic language, without which, the visual representation would not make sense. Raw personal data, to a some degree, is a mark and an extension of a subject’s existence. But when personal data is visualized quantitatively — through points, charts, and lines — it no longer conveys the subject’s existential extension. The data, which can carry a sign of the subject’s presence, is simplified into a visually materialized representation. How can I manifest this disconnection and bring the significance back. Human nature doesn’t have to be visualized and quantified. Maybe data shouldn’t be visually represented and perhaps must be something that we keep to ourselves. But whenever we decide to manipulate it, why not manifest the nature of this dat? Transforming data into something that can be instrumentally visualized, shouldn’t be viewed as the only approach to using data. We can create a representation of data that translates its chaotic and unordered nature. This process is what is defined by computer science and Wikipedia as disambiguation.2 It is a reduction not only of the image but of knowledge, and culture towards what can be more easily processed. It is a process that extracts meaning out of data—that would otherwise be incomprehensible to humans, but is made comprehendible using machines. It is similar to the way humans read visual representations of data, in a sense that it disregards the its human quality of the data. But computers are able to process this data at dozens orders of magnitude faster than humans can. When personal data is disambiguated, it becomes less relevant if the subject is living or not. The outcome is the same — a materialized representation of a subject’s data that can be quantified and optimized. I no longer see my data as an extension of my existence, but I do see how my behavior can be quantified, optimized, and determined. With our current technologies, a human existential extension is scarcely conveyed through 1’s, 0’s. But one can adhere to the ideas of science fiction that envision a brain-computer interface that could potentially allow the translation of human subjective experience through digital information and data. But until the day when such a product of fiction becomes a reality, any stranger that looks at the representation of someone else’s personal data; would only be able to perceive its informational quality, but not its subjective part. Or perhaps, we can envision a modern equivalent of Picasso or Kandinsky, who would be able to express subjective experiences using data. Perhaps it would be a pioneer of data expressionism. Following Einstein’s view on the subject of data, I wanted to find ways of how I can find ways of embracing my own personal data. Maybe visualizing isn’t what I’m supposed to do with it. Maybe visualizing it, but not towards informational ends, would give it more meaning. Just as Frick surrounds herself with data, I could do the same with my own data. There would be some aesthetic that will make me think something positive about the fact that this was generated from my data. Abyss is a profoundly allegorical word. It has multiple meanings including words like Hell, a bottomless pit, a voided space, or an imminent catastrophic happening. This is the term that I eventually realized embodies my personal data, as apposed to something orderly and harmonic. It is an allegoric word that does not necessarily ascribe beauty to data, but does not dismiss it as meaningless. It is the last resort for me to find meaning in my data. The abyss is a place where everything is neither meaningful nor meaningless. This gives me a chance to float with my data in give it an opportunity to express itself. Where the experience of the existential quality of my data becomes more important than its meaning. It is a feeling that welcomes an awareness of the past, present, and the future. But ultimately, what is the relation between me and my personal data and how is it useful on a personal level, rather than it just being a constituent of millions of other data points. Many individuals willingly submit their personal data to various entities. The trust of our personal data is in the hands of entities that know how to extract meaning out of it. This made me reflect on the quality of my raw personal data when meaning is not extracted out of it. I concluded that best word that describes the quality of raw data is abyssal. Snowden’s revelations of imagery are is an interesting relation to data. It is labeled as a “secret”, yet one one cannot see anything on it. Although the image was later decrypted by GCHQ technicians to reveal a picture of clouds in the sky. This however conveys how our perception of data is entirely mediated by digital technologies and the agents who manipulate these technologies. “Snowden’s image of noise could stand in for a more general human inability to perceive technical signals unless they are processed and translated accordingly.”4 The data of this particular example of course, comes from a video stream from a military drone’s camera. But when personal data is the subject, there might not be a significant difference. Any subject who’s data is collected becomes materialized, it does not matter whether it is alive or not. Regardless what the subject is, it is treated the same, a subjects who’s behavior becomes more quantifiable and predictable. This does not necessarily give it a dystopian connotation to personal data, it is a matter of who posses this data. It can go as far as an ideological view that demonizes personal data no matter under who’s authority it is. But ideological or not, is there any agency remaining in us as the subjects of this data? All this activity is a process different types of devices try build their own systematized why of extracting meaning out of data. It is building a set of rules that emerge into order in the process of emergence. Another example that questions the agency of individual who are sources of data, is IBM’s Watson AI system which was experimentally programmed to potentially identify terrorists posing as refugees.5 Although it is an effective utilitarian approach for the interests of national security, it should be questioned what is stripped from the human condition. If our data allows someone to identify and quantify who we are, what is there left for us? Another unnerving example of how personal data can serve as a quantifying tool of it subjects, is what Ben Waber, a chief executive officer at Humanyze, demonstrated under Bloomberg’s article titled Wall Street Embraces Emotional Trading Surveillance.6 It is an example where meaning is extracted from our personal data that otherwise would’ve likely remained omniscient to us. If we are the owners of data, we should be the ones that need to know how to use the tools to extract meaning out of data. But instead, we give this obscured amounts of personal data to entities that know exactly how to extract meaning out of it. Nicholas O’Brien in his article Are Algorithms Conceptual Art’s Next Frontier? summarizes the romantic relation that human have with collecting and quantifying personal data. The ideas that are presented, are widely based on conceptual art.8 The materialization aspect behind data was the main concern. 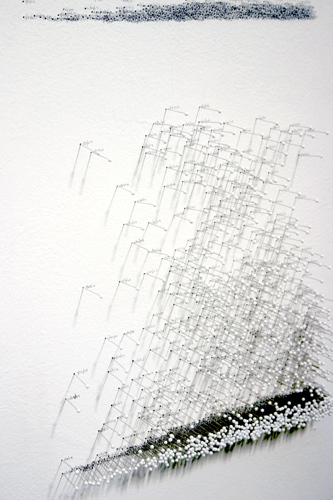 But various artist have pinpointed ways of how personal data can be humanized and transformed into something aesthetic. Many data artists are also responding to an increasingly data-saturated culture. What if we can become aware of our bodies systems, the same way we can become aware of the data that highlights inconsistencies. But will our agency over our data be guaranteed, or while there always be someone who uses the data to a bigger advantage but us? I think the only way humans can can gain back their agency and relation to their personal data, is through the act of meditation — finding new connection between our data and its humanized meaning. If we constantly extract meaning out of our personal data, what do we accomplish as humans? Are we really the ones who extract meaning out of it? Or does someone else do it for us? What is the implication of quantifying ourselves and how does that augment our human nature? If it even does so at all. Perhaps it deteriorates it. Maybe quantifying ourselves through our personal data just makes us less human and materializes our nature.